Active learning solutions can improve student success. POI is dedicated to understanding how educational experiences best take place and the spaces necessary to facilitate effective learning. POI Business Interiors is focused on helping schools, colleges and universities create the most effective, rewarding and inspiring active learning environments to meet the evolving needs of students and educators. Using an insight-led approach, we offer solutions for the many spaces where learning happens, from classrooms and libraries to in-between spaces and cafes. We have a passion for understanding how learning best takes place and how smarter, active learning spaces can help. Pedagogy, technology and space, when carefully considered and intentionally designed, can establish new protocols for advanced learning environment solutions. When the space, furniture and technology can readily adapt to the pedagogies and teaching preferences of instructors, classroom planners and designers will have made a significant contribution to the educational process. 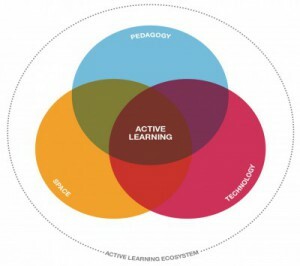 Active learning solutions can improve student success. POI is dedicated to understanding how educational experiences best take place and the spaces necessary to facilitate effective learning. Furniture in the classroom and within educational facilities needs to be multifunctional, inspire creativity to achieve deeper learning, and maximize the space while keeping the same look and feel throughout. Education is a sector that changes with scholastic standards, types of curricula and teaching strategies. Both educators and the creators of learning spaces are rethinking the structure of classrooms, libraries, hallways, common areas and the learning spaces in between. A learning environment is a place we go to acquire new knowledge or skill from a teacher, instructor or study material – be it a classroom, training room, lecture hall, or dormitory. The introduction of flexible, movable components and tools within these environments addresses the numerous approaches used in sharing knowledge and, in turn, effectively facilitating learning. We implement solutions that help educators and institutions achieve better results. Trends towards active learning include: integrating user-friendly technology with classroom and lecture furniture, creating social hubs and study areas for collaboration, flexible furniture to optimize space and new learning tools. Steelcase products are designed with the research and development resources of the world’s largest office furniture manufacturer. Their products are ideal for such applications as interactive classrooms, cyber cafés, breakout rooms and training facilities. Products manufactured by Kwalu are built to be virtually indestructible, scratch resistant, fire retardant, waterproof and graffiti proof. As a result, the products are ideal for dormitories, student unions, lounges, dining areas and libraries. Whether an educational facility is renovating an existing space or are creating new state-of-the-art campuses, POI can provide economical strategies and smart furniture solutions. Many educators are embracing a more active and immersive style of instruction, engaging with students, leveraging technology and exploring more and varied educational strategies. Formal learning spaces where technology and the physical space are integrated to support pedagogy and create a more active and engaging experience for instructors and students. Informal learning spaces should offer students a range of places and the choice and control to select the best environment for their needs–focused individual study, dyadic work, or large team collaborative. The Node chair is mobile and flexible. It’s designed for quick transitions between room configurations. With Node, a classroom can flex from lecture mode to groups, and back again without interruption. Node can take passive space and make it active, supporting active and team based learning, even when student density is important. ēno allows instructors and students to capture and distribute lesson notes, create collaborative lessons for multiple users and project important content for discussions. ēno adapts to any classroom, instructor and student, with multiple configurations to fit any learning space.